It's time to get some sunshine on your skin and some salty air in your lungs. The new expansion for T.I.M.E. 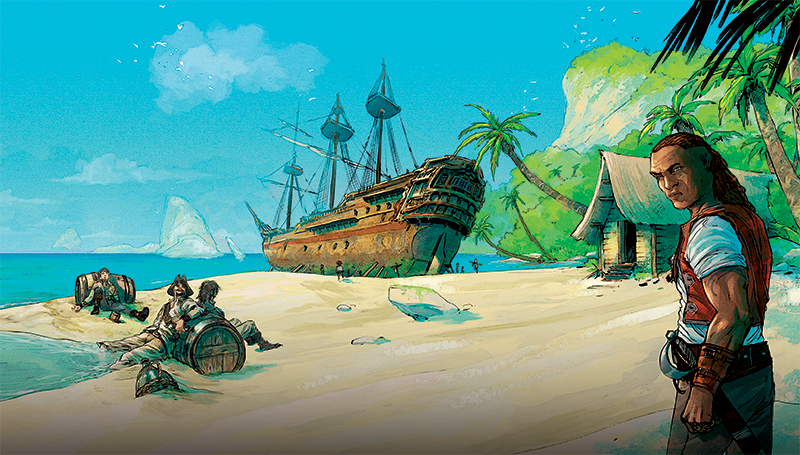 Stories has been announced, and it's sending players to the golden age of piracy. Brotherhood of the Coast is the name of this new set, and you'll be looking to find out what happened to a previous team that was sent to the same time but never came back (because that's not ominous...). We’ve tried to keep this blunder under wraps, but the situation has gone beyond our control, which is the exact reason we’re sending you, agents. Some time ago, four seasoned agents, just like yourselves, were sent to this timeline. Unfortunately, something went awry, and we’ve lost their trace. It’s up to you to track them down and… release them from their receptacles. More details on that at a later date. We’ve seen the way you handle yourselves in the field, and believe you possess the exact skills we need to bring these agents home.